Zaros is one of the oldest and most powerful gods in Gielinor with a rich and interesting backstory dating back to the second age. At the height of his power, he ruled a vast empire with some of the most powerful races as his subjects and his abilities were considered by some people to be on a par with that of Guthix himself. While the God Wars served to erode much of his memory, much information about Zaros has been revealed through quests, especially The Dig Site, Desert Treasure, and The Temple at Senntisten, although information about him is also revealed in many more quests. Speak not his name. I would sooner attend a thousand Saradomin lectures than hear his name in my presence. Zaros, or "The Empty Lord" as he is sometimes called, is the deification of Dark energy. Zaros is the God of Fate, and as such is extremely powerful, surpassed only by the Elder Gods. Zaros was unique in the sense that he never "ascended" to godhood; he and his counterpart Seren were created by Mah, the youngest Elder God near the very beginning of time itself, and were born as gods on a distant world named Freneskae. Zaros and Seren originally stayed with Mah. But while Seren wanted to stay with Mah, Zaros always saw Mah as immature and childish, and left to search for a new world. The very first world Zaros stumbled upon was the Demon Realm of Infernus. It was here that he encountered the giant Chthonian leader, Hostilius. The Chthonians had the unique ability to absorb the entire life essence of what they ate, including memories and knowledge. However, their use of this ability gave rise to cannibalistic tendencies, and their numbers were dwindling. Hostilius himself had eaten several of his kin, which caused him to grow to a great size. Zaros made an agreement with Hostilius- all he asked for was the ability to command twelve legions of demons. In return, Zaros offered the avaricious ruler the ability to travel between dimensions and worlds. To the Chthonians, this was a solution towards their extinction problem. New worlds meant that new races of creatures and beasts could be devoured, thus ensuring that the Chthonians wouldn't need to resort to cannibalism and thus "eat themselves out from the inside." However, Hostilius was so greedy that he did not want to lose command of even a single legion. So in a devious move, he drew up a Magically Binding Contract. In this contract was a clause that decreed that the loyalty of the twelve legions in question would remain with the eldest member of the party- who Hostilius believed to be himself. Zaros noticed the change when reviewing the contract, but did not object; allowing the contract to be signed. Hostilius roared in pride, believing he had triumphed, but Zaros revealed his mythical origins to the demons present. The demons were an ancient race; but Zaros predated most of the universe we know today. This incident humbled the giant Hostilius, who instantly gave control of his twelve strongest legions to Zaros. The Chthonians would later be almost completely eradicated or exiled by Zamorak. Meanwhile, Zaros' acquisition of these legions meant that he now had tremendous military prowess- especially since the demons allied to him had the inherent ability to gain the memories and experience of the fallen enemies, soldiers, and combatants they devoured. Zaros then went to the realm of the Vampyres, a place he dubbed "Vampyrium." It is wasteful, both of these predators and their prey. They can be put to better us. I intend to teach them of society, of culture. Unified, they could perhaps cease their infighting and become greater than the beasts they are. Zaros observed several vampyres working in packs to hunt down much weaker creatures. He realized the inefficiency of this subsistence strategy, and introduced himself to the vampyres; believing that he could help these creatures overcome this petty lifestyle, and devote themselves to a new, greater cause. To these creatures, Zaros introduced society and culture, which he had picked up from his time with the Chthonians in Infernus, causing a quantum leap. This caused the formation of the Vyrelords, the nobility amongst the Vampyres. His contributions towards the evolution of Vampyric society, as well as his belief in them earned Zaros the fealty and allegiance of the entire vampyre race. Now with the loyalty of two powerful races, Zaros continued wandering across the universe, and encountered other gods. But he found that they were not like him and Seren; they were all mortals who had ascended to Godhood by means of some Elder Artefact. He marvelled over this, admiring how these mere mortals managed to overcome their inherent, biological and metaphysical limitations and transcend their mortality. He attempted to rally all these Gods under his banner, but the pugnacious and individualistic nature of these gods caused them to rebuff Zaros, sometimes with violence. Zaros eventually left and stumbled upon Gielinor, the land of RuneScape, at the Second Age, soon after Guthix had started his great sleep. His arrival would become amongst the greatest events to ever take place in Gielinor. Zaros arrived at the village Senntisten, which was ruled by Loarnab, an immensely powerful but intellectually compromised God. Zaros' legions quickly captured Loarnab, allowing Zaros to use his incredible magical abilities to transmogrify the powerful God into an animated power source, which he used to transport more armies to Gielinor from Infernus. This awe-inspiring display of power, along with the mere sight of Zaros' virtually unmatched mastery of magic made the inhabitants of Senntisten quickly declare fealty for Zaros. Senntisten would become the capital of the vast empire Zaros was on the verge of creating. A significant change that happened at this point was that Zaros never again participated directly in battle, instead leading his armies from behind the scenes. Zaros eventually managed to conquer a great deal of Forinthry, a place now known as the Wilderness. A great deal of humans flocked under Zaros' banner, but Zaros also wanted to unite all the younger Gods under his cause as well. Unfortunately, he was unsuccessful once again. Zaros eventually managed to create an empire that would become the largest ever in history itself. Scads of fortresses and important cities were built, including Ghorrock in the far north, Kharyrll in the Far East, and other cities like Annakarl, Paddewwa, Carrallanger and Dareeyak. However Senntisten would continue to be the heart of Zaros' empire, and evolved from what was initially a village to the most advanced city of its time. The Mahjarrat Akthanakos would later describe the city as being "not an administrative centre, but a great living creature in the centre of the empire." the only other close contestant being the elven city of Prifddinas, where Seren had reached Gielinor. However, Zaros succeeded in capturing the World Gate from the Elves in Tirannwyn, showing that he was superior in terms of military strength, although Seren, the patron god of the Elves, was notably absent during this time, having shattered herself into shards. The empire was constantly being expanded however, with military campaigns in all directions, but most notably towards the south. Zaros tried to gain the Menaphite Pantheon's Kharidian Empire. The Menaphites fought valiantly, assembling a grand army, and investing in mercenaries from the East, but in vain. Zaros was simply too powerful with his vast armies of demons. It was then that Ichthlarin, God of the Dead, and Amascut, God of Rebirth, hurriedly left to gather reinforcements from another world. They stumbled upon Freneskae, a world of constant warfare where survival itself was a challenge for any being. It was on Freneskae that they encountered a tribe of extremely powerful magicians, called the Mahjarrat. Icthlarin offered the Mahjarrat a chance of escape from the tumultuous living conditions of Freneskae, and asked them for their help in fending off Zaros' army back at Gielinor. The Mahjarrat made the decision to go to Gielinor like they always did- after a nice, long battle! Eventually they agreed to return with Icthlarin, in exchange for the promise of always being at the heart of every war. Amascut, however, was shocked beyond belief after her visit to Freneskae. The land was incredibly difficult to traverse through, and the constant warfare of that domain had caused immense psychological damage to the God of Rebirth. She would become the Devourer, The God of Destruction. Upon arrival, the Mahjarrat vanquished the Zarosian troops without breaking a sweat. Finally, an army was present who could rival Zaros in terms of military strength. The Mahjarrat were so powerful that they forced the Zarosian troops to retreat to modern day Al-Kharid. However, the chthonian Legion commander Ceres offered the Mahjarrat to join his side instead. One Mahjarrat, Sliske, had entered a quarrel with Icthlarin, agreed to join Zaros. The other Mahjarrat gathered to discuss the offer. The Mahjarrat also had an important discussion that would change their lives for centuries to come. Back on their home world of Freneskae, they would periodically sacrifice one of their own to appease the Elder God, Mah. Some argued that since now they were far away from the Omnipresent eyes of "Mother Mah," they wouldn't need to engage in this practice. Amidst their quarrels, Zaros came to them and asked about their problem. Azzandra quickly told Zaros of the history of the Mahjarrat. Zaros quickly deduced that the Mahjarrat obtained their magic not from the Anima Mundi on Gielinor like most races, but instead gained energy from Freneskae. Being away from their homeland would undoubtedly cause their power to diminish gradually over time. Zaros explained to the Mahjarrat that to rejuvinate themselves, they must perform this sacrifice periodically. Zaros also explained that the Mahjarrat may face the problem of extinction if they performed this "Ritual of Rejuvination" too frequently, and advised them to only do it once every 500 years. The Mahjarrat Wahisietel soon discovered of a syzygy, or a special alignment of the start that repeated only once every 500 years, and shared this with the other Mahjarrat, who agreed to perform the Ritual when this syzygy took place. Zaros proved to be very empathic and helpful to the Mahjarrat. His immense control over magic helped him create a duplicate Ritual Marker, which he offered to the Mahjarrat. Zaros' deep understanding of the Mahjarrat proved to be the deciding factor. The Mahjarrat all deserted the army of Ichthlarin, and joined Zaros' instead, becoming renegades. Never again would the people of Sophanem or Menaphos ever trust the Mahjarrat. The Mahjarrat were not the only race who joined Zaros. Zaros travelled to the home of the Ilujanka race, a group of peaceful creatures who rode Guhrs for a living. However, their race was sterile, and proved to be incapable of reproduction. Their numbers were slowly thinning out. Zaros came to them, offering to find the cure for their infertility in exchange for the loyalty of a few Ilujanka. The race quickly agreed, and sent a few back with Zaros to Gielinor. There, the once peaceful race discovered that they could communicate with the various Dragons of RuneScape. They quickly became known as "Dragon Riders," and were both respected and feared. One Dragon Rider in particular, named Hannibus, rode a legendary dragon with three heads, revealed to be the fabled King Black Dragon. The Zarosian army found itself to be in an incredible position. The acquisition of the Mahjarrat and Ilujanka races had bolstered the already formidable army. Their military power was now undoubtedly the greatest Gielinor had ever seen. They decided to continue the military expedition to the South, and vowed to conquer all the forest in the name of Zaros. However, the Kharidian kingdoms, now at a massive disadvantage, found help in the head of their Pantheon- the God of Light, Tumeken. Tumeken gathered an army to oppose the vast and powerful Zarosian one. Knowing that the fate of their ancestors depended on the outcome of this fight, they joined Tumeken in making the Ultimate Sacrifice. Tumeken and his entire army combined energy, and self destructed. The massive explosion obliterated the once plush, green lands, turning them into the Desert we see today. The incredible attack had also created a major dent in the Zarosian army. Thanks to the quick thinking of Azzanadra, who erected a barrier around some of the Mahjarrat, a few survived. Weakened drastically, the Zarosian forces retreated back to Senntisten. The Zarosian empire was now at its peak. However, Zaros was becoming less and less involved in its daily affairs. He reflected upon his long life, and after remembering the entire civilizations his armies had eradicated, decided to let his vast kingdom rule itself. Some saw this lack of involvement and became wary. It was believed that Zaros ruled from the Shadow Realm, and that he was perhaps gone to another realm to add to his already invincible army. Others saw this is a golden opportunity. The Mahjarrat Zamorak, who was appointed as Legatus, or Commander of a legion of Zaros' forces, slowly began reaching out to other powerful individuals, persuading them using his wit. He reached out to fellow Mahjarrat like Lucien, Hazeel, Palkeera, Ralvash, Zemouregal, Enakhra, Khazard and others, including the human Viggora. To each, he pitched the idea differently. He addressed Lamistard as a fellow warrior, claiming that they were now treated the same as priests and bureaucrats, and they needed to take their birthright through force. Zamorak argued the opposite with Ralvash, saying that Zaros had forsaken the Mahjarrat of their traditions and culture, and that they needed a leader who truly understood the Mahjarrat. To Zemouregal, a Mahjarrat who would later enslave Arrav, the hero of Varrock, and Hazeel, he complained of stagnation in the Empire. Zamorak claimed that both of them knew that only through chaos could real strength emerge, and they had a responsibility of freeing the world from Zaros' tyranny. And to Lucien, a Mahjarrat who would later try to emulate Zamorak, he offered an army and lands to rule over, saying that Lucien had great potential and was getting squandered and wasted as a mere Tribune. Zamorak also made plans to neutralize the strongest of his opposition. Nex, the strongest Nihil ever created, was protecting the Mahjarrat ritual marker when she was lured into The Temple of Lost Ancients with her army. She was then locked and frozen in the Temple. To this day, her army is the last surviving Zarosian army in RuneScape. 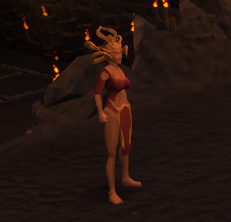 Char, an Auspah who had mastery over fire, was assigned to accompany Zamorak on a mission to the Elven lands. Char was rumoured to have been part of Zaros' concubine, and amidst an ambush by the Elves, Zamorak strode over to Char, and impaled her with a poisoned dagger, leaving her to die far from home. Char would enter a magical sleep, and would survive, vowing to destroy Zamorak for his betrayal. However, the Zarosian faction was still stronger. With the God of Fate at their head, they seemed invincible. Even without Nex and Char, others still existed who had tremendous power, such as the Mahjarrat Azzanadra. But then came a famous turning point in RuneScape history- the acquisition of Elder Artefacts. Through a series of unfortunate events, the Staff of Armadyl made its way to the hands of the Human Viggora. Although he was one of Zaros' most highstanding generals, and one of the most powerful humans in history, he himself worshipped Zamorak. He gave the Staff of Armadyl to Zamorak, and changed the course of history for years to come. It was around this time that Zamorak also came across the Legendary Stone of Jas- an object capable of increasing the capabilities of anyone who were to touch it by an exponential margin. The acquisition of one Elder Artefact was enough to make Armadyl a God. Zamorak had two. Things were not looking good for Zaros. Zamorak amassed his faithful, and went to Zaros' citadel, claiming they wanted to discuss "Battle Formations". Zemouregal and the others kept Zaros' generals busy, while Zamorak went to Zaros' chambers himself. What happened next was shrouded in mystery. Many legends have been written about what happened when powerful Zamorak squared off against the God of Fate, but there were no witnesses to the extraordinary event. Some say Zaros lost his footing, some say Zaros was overwhelmed by Zamorak, others say Zaros exploited the opportunity and left Gielinor for good. But at the end of the battle, Zamorak was exhausted, and somehow had siphoned a part of Zaros' incredible energy. The resilience of the Empty Lord had left Zamorak fatigued, and he collapsed in Zaros' incredible throne room. Zaros felt himself fading, and knew that he had to either exit his body and assume an incorporeal form, or die. He then left his body- his last act being to whisper a curse in the air, causing everyone associated with his downfall to be cursed to dwell in the Shadow Realm for all eternity. The Mahjarrat and Demons, who were incredibly adept at magic, could resist this curse, but the same could not be said for the humans. The powerful human Viggora had found himself bound to the shadow realm. At the end of the fight, Saradomin and Armadyl appeared. They cursed Zamorak and banished him for slaying a God, for slaying one of their own. They both laid claim to one of the Elder Objects- Saradomin took the Stone of Jas, calling it "The Eye of Saradomin," and Armadyl reclaimed his staff. Zamorak was banished, but the deal he made with the greedy Avernus race had saved him. Several Avernus came through a portal, and dragged Zamorak back to their own world- where he would remain for 19 years. 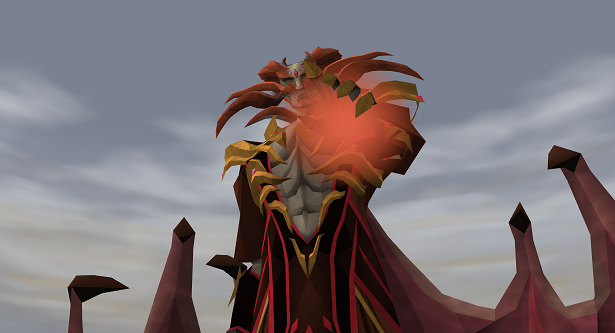 Zamorak ended the Demon revolution, resulting in the almost extinction of the Chthlonians. Zaros' departure from Gielinor meant that the vast Zarosian army was without a ruler. The ever- loyal Azzanadra made a Herculean effort to stabilize the empire, and succeeded for a while- driving the Zamorakians out of Zaros' capital. But cracks were beginning to form. The combined force of the Saradomin and Zamorakian forces began to level the great Zarosian cities. The only one that managed to survive was the Ghorrock Fortress. But the Zarosians eventually fled from there too; the fortress was somewhat cut off from the empire. Powerful creatures would later gather in the forsaken settlement, including Iron and Steel Dragons, as well as Ice Fiends and Waterfiends. Azzanadra however, saw a golden opportunity, and hid the Frostenhorn - an artefact capable of multiplying the strengths of its surrounding objects (similar to the Stone of Jas) in Ghorrock. He also left a guardian behind, a powerful Ice Demon. Azzanadra also gave the Barrows icon to Sliske, telling him that it would help Zaros to return to Gielinor. Sliske kept the icon with his powerful Barrows wights. The icon's special ability allowed it to gain power from everyone who were killed in the nearby Barrows vicinity. As the ages passed, the Barrows Icon gained power at an almost unprecedented rate, siphoning divine energy from all those who died at the hands of the Barrows Brothers. While the Zarosians were losing a few battles, they also won a few by an impressive margin. The city of Uzer was attacked by Demons. The city constructed several thousand clay golems to defend itself from the Zamorakian Devils, lead by Thammaron. The clay golems managed to hold them off, and prevented the demons from entering the city walls. Outside, the extremely powerful Mahjarrat Azzanadra single-handedly wiped out the entire Demon army. Such was the power of those still loyal to Zaros. What came next was a time of great instability on Gielinor- called the "God Wars." Zamorak became a God on Infernus, and could power his way back to Gielinor. The God of Chaos had returned after 19 years of constant warfare. He waged a battle for the Stone of Jas, which expanded into the famous God Wars. These wars lead to the almost complete eradication of the Zarosian empire- to the point were no one had ever heard of "Zaros" by the 5th Age. One by one, all of powerful Zarosian warriors were neutralized. Nex was fighting against gargantuan odds, trying to defend the remaining Zarosian settlements. On one such instance Nex was trying to defend the Mahjarrat Ritual Marker, when suddenly the armies retreated. Nex, never one to spare an enemy, went in pursuit. This turned out to be Nex' undoing. The armies trapped her inside the cavern, called the Temple of Lost Ancients. Once Nex swooped inside, they cast a spell that bound her and her army inside the temple's frozen walls. The key to Nex' resting place was broken and split amongst the 4 major factions involved in her downfall- those of Saradomin, Zamorak, Bandos and Armadyl. Thus, Nex, the Nihil that the Gods themselves feared, was trapped and left unable to escape from her Frozen Prison. To day, her army is the last surviving army of Zaros in Gielinor. Slowly, more and more of the remaining loyal Zarosians began to fall in battle. The biggest blow came when Zaros' Legatus and Champion fell in battle. Azzanadra fought valiantly, stashing away items that he thought could help Zaros to return to Gielinor. He fought single handedly against entire armies, and always managed to survive. He gained the respect of several Bandit Camps at this time, who respected his incredible military prowess and abilities. To the few surviving Zarosians, Azzanadra became the embodiment of hope. The idea that a single warrior could stand up against an entire army was perhaps what motivated the Zarosians to take one final stand. However this was not to last. Saradomin and Zamorak realized that as long as Azzanadra lived, Zaros would still remain in this world. They then decided to combine their armies in an alliance for a brief while, to subjugate the powerful Mahjarrat. Azzanadra fought bravely, and managed to ward away the fighters, a testiment to the incredible abilities of Zaros' most loyal servant. The Zamorakians realized that he was almost invincible in battle, and thus decided to subdue him in the same manner they did Nex. They pushed Azzanadra back into the Jaldraocht pyramid, and once inside, they created 4 diamonds, each storing a part of Azzanadra's power. These four diamonds represented the four elements of the ancient world- Shadow, Smoke, Ice and Blood, and were taken by four Zamorakian warriors- Kamil took the Ice Diamond and retreated to the Ice Pass, Malak took the Blood Diamond, Fareed the Smoke Diamond, and Damis the Smoke Diamond. Each warrior was exposed to their respective diamond for so long that the diamonds changed them, and moulded them, and they gained significant control over the corresponding ancient element. In a few years, the name of Zaros was eradicated from Gielinor completely. An empire that once seemed larger than life itself was no more. In the year 169 of the Fifth Age, an adventurer working at the Digsite east of Varrock comes across a strange talisman. After consulting with an archaeological expert, the talisman is decidedly from the remains of an ancient city that once stood where the Digsite is located today. Upon further excavation and exploration, the talisman is discovered to be Zarosian in origin. For the first time in centuries, Zaros' name was spoken on Gielinor. Little did they know at the time, the adventurer would soon become a key factor in the Fate of the Gods and the World itself. Later the same year, the adventurer spoke to an archaeologist at Bedabin Camp in the desert, about the prospect of finding treasure in the desert. The Adventurer discovers the Pyramid of Jaldraocht, and learns that there are four diamonds that hold the key to solving the Pyramid's deepest mysteries. The location of each could be discerned from looking into the one of the Four Mirrors located at the Bandit Camp Lodestone. 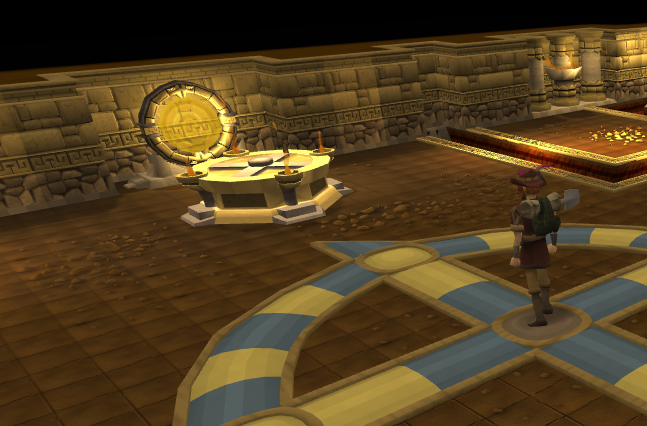 Each diamond was guarded by a powerful Zamorakian general, located at the far ends of Gielinor. Gathering them would prove to be a challenge to even the strongest and most resourceful heroes. Our adventurer, however, was relentless in his quest, and after killing Kamil for the Ice Diamond, Damis for the Shadow Diamond, Fareed for the Smoke Diamond, and earning the Blood Diamond from Malik after putting his rival Dessous to rest, the adventurer head off to Jaldraocht. But not even he could have imagined the ancient secret behind the walls of the Pyramid. After traversing through several hundred mummies, the Adventurer reached the central chamber. He prayed at the altar, and in the process, freed a Mahjarrat from his prison. After the Mahjarrat granted the adventurer the use of the Ancient Magicks, he was revealed to be Azzanadra, Pontifex and General of Zaros. The most loyal servant of Zaros had finally returned to the fray. The Zarosian storyline continues when our Adventurer is directed by Wahisietel of Nardah to Dr. Nabanik. The Adventurer had met Wahisietel on a separate quest, where he aided the Mahjarrat Jhallan in find a resting place so he could siphon the energy from the Ritual of Rejuvination, without being a direct participant. The quest had also taught the adventurer about a fearsome looking beast called the "Muspah," which Jhallan said were common back home at Freneskae. Nabanik soon reveals himself to be Azzanadra, and asks for the Adventurer's help in re-establishing the long lost Temple of Senntisten. To do so, however, the Adventurer needed to infiltrate the last standing Zarosian settlement, Ghorrock. Due to its remote location, being bordered by the Wilderness and being patrolled by vicious Ice Dragons, Steel Dragons on the outer perimeter and Icefiends and Waterfiends within its inner walls, Ghorrock had been difficult to overrun during the God Wars. Unfortunately, no one survived, presumably due to the lack of supplies. The remote location which had allowed it to survive had also, eventually caused its destruction; the proverbial two-sided dagger. Upon reaching Ghorrock, the adventurer found a way past the huge slabs of ice blocking the entrances, as well as the large number of monsters until he reached the deepest chamber of the old Zarosian settlement. Guarding the artefact he sought (the Frostenhorn) was a monstrous Ice Demon. The adventurer, however, would not be impeded, and after dispatching the demon, returned to Azzanadra, who then requested another artefact- the Barrows Icon. The Barrows was a forsaken tomb far in the depths of Morytania. Ages ago, after the fall of Zaros, Zamorakians under the Vyrelord Drakan had taken control of the Saradominist settlement of Meiyerditch, which until then was guarded by the last pure blooded, royal Icyene- Queen Elfaritay. After kidnapping her husband, who was a human, the cunning Vyrelord forced the Icyene to surrender herself. Little known to him, however, Elfaritay had a son- who the adventurer would later meet as part of his adventures alongside the Myreque. However, the Saradomin forces were still formidable, even after their Queen's forced abdication. Six legendary warriors arose, each having been granted a suit of armour by the Mahjarrat Sliske. Battle after battle, each brother crushed hundreds, mastering a different combat style along the way. However, the Mahjarrat Sliske turned on them at the last moment before their greatest (and deciding) battle, enslaving them all to the Shadow Realm where they would serve him as his wights until the end of time. These legendary warriors were hurriedly buried into a tunnel system known today as the Barrows. Many adventurers made their way to the Barrows, in the hope of finding great treasure, or a piece of the brothers' legendary armour. However, the spirits of the brothers defended their crypts, killing scads of people on a daily basis. Sliske, however, had been given a special artefact by Azzanadra before the latter would be captured at Jaldraocht. This was kept at the Barrows, where it was aptly dubbed the "Barrows Icon." It had a unique ability- to siphon the prayer energies of all the adventurers who died in the Barrows. After absorbing these energies for thousands of years, it had become powered beyond comprehension. Our Adventurer managed to navigate through the Barrows, obtaining the Icon, which he returned to Azzanadra. Azzanadra then combined the Frostenhorn, the Barrows Icon, and a Saradomin Relic from Entrana to build a portal of communication. Through this portal, he finally managed to communicate with Zaros. Contact had been established at the newly rebuilt Temple of Senntisten, and Azzanadra could now converse with The God of Fate again. Later that year, syzygy occurred, and the Ritual of Rejuvination was held. During the battle that ensued between the Zamorakian and Zarosian Mahjarrat, Azzanadra summoned the power of Zaros using a few beacons he had hid around the battlefield. This energy dealt over 13,000 damage to Lucien in two separate hits, leaving him with around a quarter of his health left. What is noteworthy about this moment is that Lucien at the time, was the wielder of two Elder Artefacts- the Stone of Jas, and the Staff of Armadyl; he was very, very close to attaining Godhood himself. Zaros, while being in an entirely different realm, had managed to almost destroy a God completely. In the end, Zarosian Mahjarrat Jhallan was sacrificed, although Lucien later succumbed to an attack by Dragonkin. But still to come was the most shocking moment; one that ended the Fifth Age. 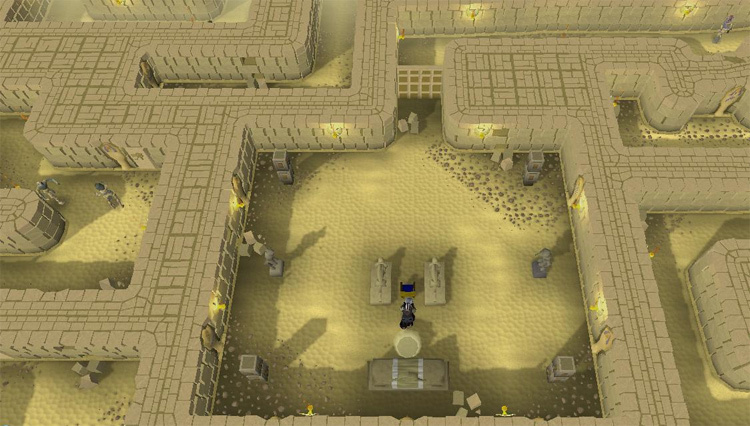 An archaeologist from Varrock, named Orlando Smith, was near the Legend's Guild when he encountered a massive underground complex. It was here that he met our Adventurer. Together, they deduce that the caves were the resting place of Guthix, the God of Balance. His edicts kept the other Gods out of Gielinor. Orlando could not enter the complex, as the doors proved too much for him to open with brute strength. Our Adventurer, however, had much more success with them, and the two proceeded to enter the underground chambers. They encounter several relics. However, in the hope of salvaging some artefacts to take back to the Varrock Museum, they encounter traps in the form of Automatons. One of them kills Orlando Smith, leaving the Adventurer to fend for himself. 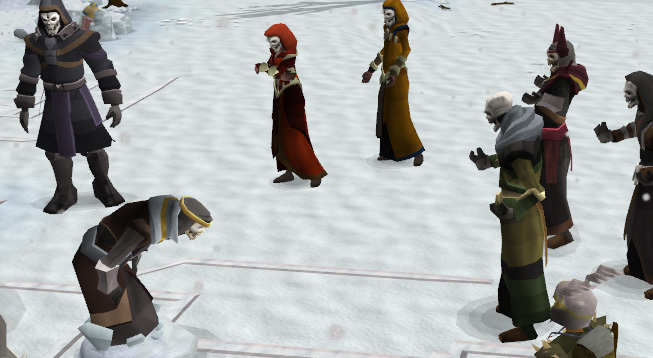 After dispatching the Automatons, a shadowy figure appears and demands to know who dared to wake Guthix. This is revealed to be the Mahjarrat Sliske, who tells the Adventurer that the traps had set off an ancient alarm system that had been around since the Edicts themselves. All around the world, stone circles have activated and were transmitting. One of them, at Varrock, had been taken over by Dark Wizards. Upon seeing the circle activate, one of them teleported to the Mahjarrat Zemouregal, and told him immediately. Zemouregal commanded the Wizard to trace the original source of the transmission. Even the Gods know the true meaning of the alarm system- that Guthix's location has been compromised. They quickly communicate with their Generals in the God Wars Dungeon, and soon all four generals leave the Dungeon and start heading to the complex where the Adventurer is at. Sliske makes it clear to the Adventurer that he will have to choose who he would side with- the Zarosians, who want to wake up Guthix to negotiate with him, the God Wars factions who seek to kill Guthix, or the Guardians, who seek to protect Guthix at all costs. Sliske suggests that the Adventurer first side with the Guthixians so that they get closer to Guthix. After defeating Kree'arra, the adventurer navigates further into the complex where he encounters the Guardians of Guthix. Upon hearing the adventurer's claims that he is on their side, they are initially suspicious, but quickly relent, saying that only someone with a special connection to Guthix could open the doors in the first place. After solving a test of balance, the adventurer suddenly is encompassed in a green aura and is blessed by Guthix, becoming a Guardian himself. Soon after, a huge battle occurs when the Guardians try to fend off the attacks by the other God's followers, all of whom want Guthix dead. Amidst the chaos, Sliske slips past everyone, and reveals he has the Staff of Armadyl, which was shattered after the Ritual of Rejuvination. With it, he unloads a fatal blow to Guthix from point blank range, killing the God of Balance. 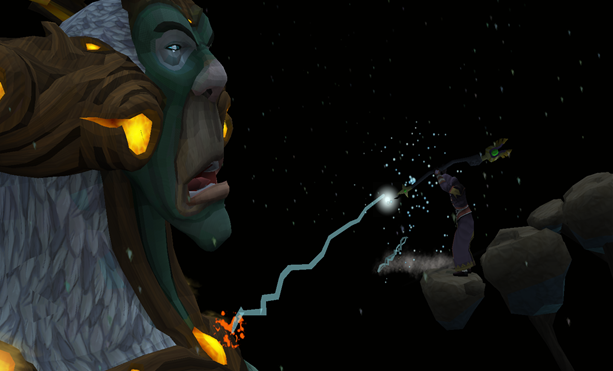 Guthix's death ended the Fifth Age, and broke the Edicts that prevented the Gods from returning to Gielinor. Saradomin was the first to appear, teleporting Nex and Char away. He attempted to do the same with the Adventurer, only to discover that the latter had been given new powers by Guthix, becoming not just a Guardian of Guthix, but the World Guardian; being now able to resist the powers of the Gods themselves. Gielinor was now open to all the Gods. Soon after Guthix's death, the World Gate appeared near the Arandar Pass. Sliske and Azzanadra stood before it, when our Adventurer arrived at the scene. Azzanadra told the Adventurer in no uncertain terms that they, and only they as the World Guardian, could do what no one else could do- bring Zaros back to Gielinor. But while the loyal Azzanadra clearly wants Zaros to return, Sliske takes the Adventurer aside and tells them to think the situation through, saying that ironically enough, the fate of the God of Fate is in the adventurer's hand. The Adventurer calibrates the world gate until it leads to Freneskae, home of the Mahjarrat, and then enters. The Adventurer navigates through the harsh environmental conditions of the world, being guided by a black sphere of energy, until they come to a chamber. Here, the ball of energy reveals himself to be Zaros, in his incorporeal form. Zaros answers much of the World Guardian's questions, and even enters the Adventurer's mind to show that he was truthful throughout. He reveals that he survived Zamorak's assault by turning his body into pure dark energy, and then coming to Freneskae, where he began siphoning Elder energy from the nearby Muspah created by the Elder God, Mah. The Adventurer is then led to the Elder Halls of Freneskae, where he/she begins siphoning Elder energy to create a simulacrum for Zaros to use as a body. Knowing that Zaros is purely dark energy, the Adventurer has to make a choice. If he made a dark simulacrum, then Zaros would return with all of his current strength. However, if he made a light simulacrum, Zaros' very being would rebel against his body, and he would be critically wounded, and it would be easy to dispose of him. Either way, the adventurer watches as Zaros' energy fills the simulacrum and the God of Fate rises again. However, the Elder God Mah could now sense Zaros' presence, and wakes up. She is about to strike at the Adventurer, who is teleported away at the last second by Zaros, back to Gielinor. Finally, after centuries, the God of Fate and Control had returned to Gielinor. He instantly called his most loyal followers, which comprised of Nex, Azzanadra, Char, and Sliske. Zaros almost immediately excommunicates Sliske for his recent actions. But... no! I... I am loyal! Have I not always been loyal? Have I not done everything you've always asked of me? As the empire fell, did I not keep safe those things necessary for your return? Was I not pivotal in the liberation of all those who stand before? DID I NOT KILL A GOD FOR YOU? Sliske protests, saying he carefully guarded the Barrows Icon, which was essential for Zaros' return, safe. Without it, Zaros wouldn't be here today. Sliske then claims that he killed Guthix solely on Zaros' command. Zaros does not pay heed to Sliske, who teleports away, smirking. It seems I'm not as good of an actor as I think I am. What gave me away? The Adventurer is rewarded with the Shard of Zaros, a piece of Zaros' very body that would mark him as a Zarosian envoy whilst being in the God Wars Dungeon. "Where Guthix sought balance in the world, I sought balance in oneself. Everything that happens in life, both good and bad, should be used to forge oneself. We must increase in power, and knowledge of how to wield that power." ~Zaros to the Adventurer, Fate of the Gods. During the Fate of the Gods quest, the Adventurer has lengthy discussions with Zaros, where he unearths a lot about the God's philosophy. Zaros' philosophy perhaps developed before he even left Freneskae; it must have infuriated him to no end to see the adolescent Elder God Mah wield so much power over life and the multiverse, yet not wield it properly, whereas someone like him had travelled the cosmos trying his best to aid those in need. "A being of such immense primordial power that she can create life with but a thought, yet she herself is a stunted child! How could such a being come to be? It frustrates me that Mah has such gifts and yet wastes them creating what one might consider amusements. Such wasted potential... But then, she did also create me." Zaros believes that everyone must strive to increase in power, as well as knowledge of how to wield that power- in other words, Strength and Responsibility are symbiotic. One of the strongest Zarosian beliefs is that everything that occurs in life, both good and bad, must be used to forge oneself, and that one must never give in to weakness; for doing so means they are not worthy of the gift of life. Soran, the emissary of Zaros, says that Zaros always has a plan, which none of us are able to comprehend; but that he will always be there as a dauntless, all knowing protector, and that our roles in his plans are both pre-ordained, and essential.